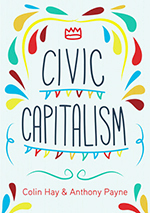 Book launch: Civic Capitalism by Colin Hay and Tony Payne – registration open! In an important new book, Civic Capitalism, published this month, Colin Hay and Tony Payne propose a new form of capitalism that would be more economically, socially and environmentally sustainable. The book consists of an extended essay by Colin and Tony, followed by a number of short comments and reflections on their argument by leading academics and political economists, including Ian Gough, Ann Pettifor, Colin Crouch, Andrew Gamble, Gavin Kelly, Ruth Levitas, and Fred Block. The book will be launched just three weeks before the general election in the Nelson Mandela Room in Sheffield Town Hall at 6pm on Thursday 16th April. The Vice-Chancellor of the University of Sheffield, Sir Keith Burnett, will chair the launch and the book will be first introduced to the audience by Ed Cox, Director of the Institute for Public Policy Research (IPPR) North. Colin and Tony will then talk about what needs to be done to build an alternative model that works for the benefit of everyone, not just the few, and how this might work in Britain today. Copies of the book will be available for purchase on the night and a reception after the event will allow members of the audience to meet and talk to Ed, Colin and Tony. Places for this event are limited and should be pre-booked via eventbrite here.